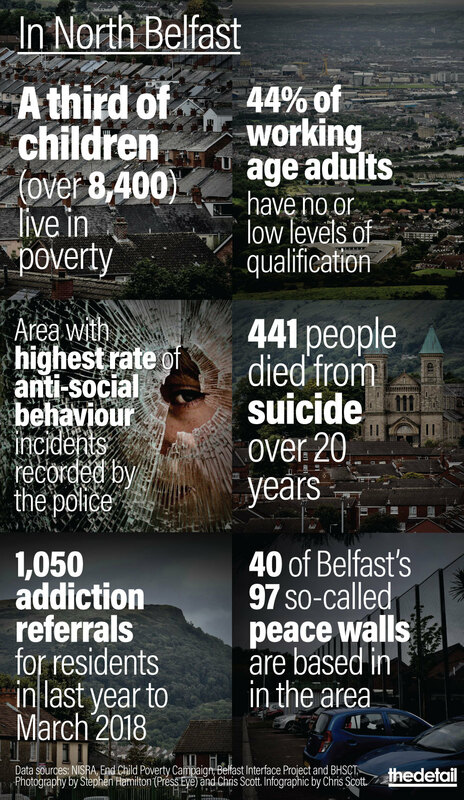 AN examination of key statistics relating to North Belfast makes for grim reading. They include a high number of suicide deaths, low educational outcomes, poor health and high deprivation levels. The legacy of the Northern Ireland conflict also continues to linger and hurt. A new initiative aims to find innovative solutions to the serious problems blighting the area and the hope and positivity retained by many of the more than 100,000 local residents will be harnessed for the cause. Ashton Community Trust, in partnership with suicide prevention charity Lighthouse, is launching an ‘appreciative inquiry’ process tomorrow at Ulster University’s York Street Belfast campus. The appreciative inquiry method aims to promote transformational change and focuses on positive dialogue. A task group will be set up to take work forward. Jo Murphy, co-founder of Lighthouse, stressed: "The greatest gift about this area is the people who live in it." The launch event is being co-hosted by the university and is supported by Belfast Health and Social Care Trust, the Public Health Agency and Belfast Healthy Cities. The high number of suicide deaths. 48% of school leavers in North Belfast are not achieving the key benchmark of five or more GCSEs at A*-C including English and Maths. A third of children live in poverty. Richard O’Rawe, chairperson of Ashton Community Trust, said: “We are keen to work with our community, health and academic partners because it is clear that change is required. “The statistics we are highlighting show, in very stark terms, what difficulties we have in this part of Belfast. They aren’t unique to North Belfast but they are a call to action for concerned leaders in this community who want to make health and life inequalities a key item on the agenda. Irene Sherry is head of Victims and Mental Health Services at Ashton Community Trust. She said: “North Belfast is a wonderful area that is infused with a rich history connected to places such as the Waterworks, Belfast Castle and the historic landscapes of Cave Hill, Wolf Hill and Squires Hill. This part of the city is home to a burgeoning film industry at the North Foreshore, tourism at Crumlin Road Gaol and is gaining a world class reputation for excellence in boxing, athletics and running. “There is no doubt that North Belfast witnessed dark days during the conflict years, and that layers of social and economic harm have compounded the scale of health and life inequalities affecting people, but by working together we can figure out innovative solutions that will make a difference. “It’s a whole systems approach we need and a new way of looking at problems that utilises and draws upon existing strengths and resources. Ashton Community Trust and Lighthouse have been examining statistics relating to North Belfast in preparation for the launch of the inquiry process. The figures will be presented to other community and voluntary groups, government representatives and politicians who are due to attend the launch tomorrow. The data includes information on education, health, housing, crime, addiction, mental health, poverty and suicide. They set out the starting point and highlight areas where improvement is urgently needed. Education is an area of concern. Forty-eight percent of school leavers in North Belfast are not achieving the key academic benchmark of five or more GCSEs at A*-C including English and Maths. Almost 44% of working age adults (25-64) living in the area have no or low levels of qualification. Then there’s the deprivation. Almost a third of children in North Belfast are living in poverty – according to the End Child Poverty campaign. That’s 8,433 children. The Department of Health’s Health Inequalities Annual Report 2018 shows rates of suicide and self-harm admissions in the most deprived areas of Northern Ireland were around three and a half times the rates seen in the least deprived areas. 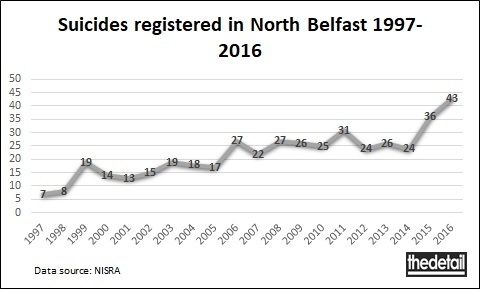 Looking at North Belfast specifically, a total of 441 suicides were registered in this parliamentary constituency over 20 years. They made up almost 10% of the total 4,612 suicides recorded across Northern Ireland from 1997 to 2016. North Belfast was the parliamentary constituency in Northern Ireland with the highest five-year suicide rate of 29.7 per 100,000 of the population from 2012 to 2016. The lowest rate was North Down at 10.4. There were 2,670 calls from North Belfast to the Lifeline crisis response helpline in the year up to the end of March 2018. That’s an average of seven calls every day from people experiencing distress or despair. The latest Northern Ireland Multiple Deprivation Measures use Super Output Area (SOA) geography to identify small area concentrations of multiple deprivation by examining income, employment, health, education, access to services, living environment and crime and disorder. There are almost 890 SOAs in Northern Ireland, each of which has an average population of around 2,100 people. Nine of the 20 most deprived SOAs are in North Belfast. And 31% of the total 58 SOAs in North Belfast lie within the top 10% most deprived SOAs in Northern Ireland. Health data was also examined. North Belfast is the Assembly constituency in Northern Ireland with the highest cancer incidence rate of 952 cases of cancer per 100,000 of the population. An average of 842 cancers were diagnosed there each year between 2012 and 2016, according to the NI Cancer Registry. The Quality and Outcomes Framework gives information on disease prevalence registers. Based on raw numbers alone and not adjusting for population size, North Belfast is the Assembly area with the highest number of patients on 10 of the 14 registers. This includes the coronary heart disease register (5,883 people in North Belfast), the stroke register (2,959), the hypertension register (20,019), the chronic obstructive pulmonary disease register (3,981), the mental health register (1,578), the asthma register (8,806), the dementia register (1,037), the atrial fibrilation register (2,736), the diabetes mellitus register (7,727) and the rheumatoid arthritis register (928). North Belfast also tops the list for the Assembly area with the highest rate of anti-social behaviour incidents at 45 per 1,000 of the population, according to the Multiple Deprivation Measures' crime and disorder figures. It’s important to note that other areas in Northern Ireland – for example nearby West Belfast – also suffer from poor outcomes in many of the areas highlighted above. But today is about North Belfast and the people living and working there trying to come up with solutions which will improve the lives of local residents. Jo Murphy is co-founder of the suicide prevention charity Lighthouse which is based in North Belfast. Lighthouse supports people bereaved through suicide and provides support services to individuals in crisis. She said: “I am from North Belfast and proud to both live and work in it. As human beings we all like to have a sense of belonging and North Belfast is that place for me that I call home. I am very proud of its history and its outstanding beauty landmarks. “I am well aware how complex it is with its interfaces and how it has been impacted by the conflict and the range of health and well-being inequalities, but the greatest gift about this area is the people who live in it. “During the worst times the one unique thing we did have was a sense of community. People cared and looked out for one and another. Somewhere along the line we seem to have lost that basic ingredient. We need to go back to basics in building our communities and seeing that the people who live in them are our greatest asset in bringing about change. Twenty years after the signing of the Good Friday Agreement, the long-term effects of violence in Northern Ireland are evident in places like North and West Belfast. Siobhan O'Neill is professor of mental health sciences at Ulster University and was part of a team which examined the trans-generational impact of the Troubles on mental health in Northern Ireland for the Commission for Victims and Survivors. Her research highlighted that the Troubles are linked to suicide deaths and stressed that young men living in working class areas continue to be exposed to interface violence and involvement in and threats from ongoing paramilitary activity. In relation to the appreciative inquiry, Professor O’Neill said: “Whilst North Belfast still bears the scars of the Troubles, the people are incredibly resilient and there are numerous examples of individuals and communities coming together to promote healing and growth. “The number one issue affecting this area of Northern Ireland is deprivation and inequality. This is borne out in the high rates of mental illness and suicide here. “My research has shown how the legacy of the Troubles and the hopelessness that accompanies the poverty trap has resulted in substance abuse, mental illness and suicidal behaviour. We have also demonstrated how the trauma and violence of the Troubles are affecting the next generation. Data sources for this article include: NISRA, End Child Poverty Campaign, Department of Health, The NI Cancer Registry, Belfast Interface Project, BHSCT, the Public Health Agency and Lifeline. Photography by Stephen Hamilton, Press Eye.